Last night the Taube Atrium Theater hosted the second concert in the 35th anniversary season of the Schwabacher Recital Series. The program was a significant departure to the usual recital format based on a selection of art songs and/or opera arias. Instead it was a staged presentation of Ludwig Tieck’s 1797 “Liebesgeschichte der schönen Magelone und des Grafen Peter von Provence” (love story of the beautiful Magelone and Count Peter of Provence). Taking an anonymous fifteenth-century French romance as his source, Tieck fashioned a prose narrative in eighteen sections with a poem embedded in each of those sections. Johannes Brahms set fifteen of these poems as songs for voice and piano, and these were published as his Opus 33. As the program notes by accompanying pianist César Cañón observe, Opus 33 is not a song cycle in the tradition associated with composers such as Franz Schubert and Robert Schumann. Brahms himself preferred to call the collection a “song bouquet;” and he rejected the idea of a publication that would interleave his songs with the appropriate selections from Tieck’s prose text. Nevertheless, Julius Stockhausen, to whom Opus 33 is dedicated, incorporated Tieck’s prose into his performance of Opus 33; and that tradition was both sustained and extended last night. Rather than just presenting Opus 33 as an alternation between talking and singing, Aria Umezawa (second-year Adler Fellow and 2016 Merola alumna) presented a semi-staged presentation, which introduced a narrator (Albert Rubio) and animated visual projections created by Cristina Garcia Martin. 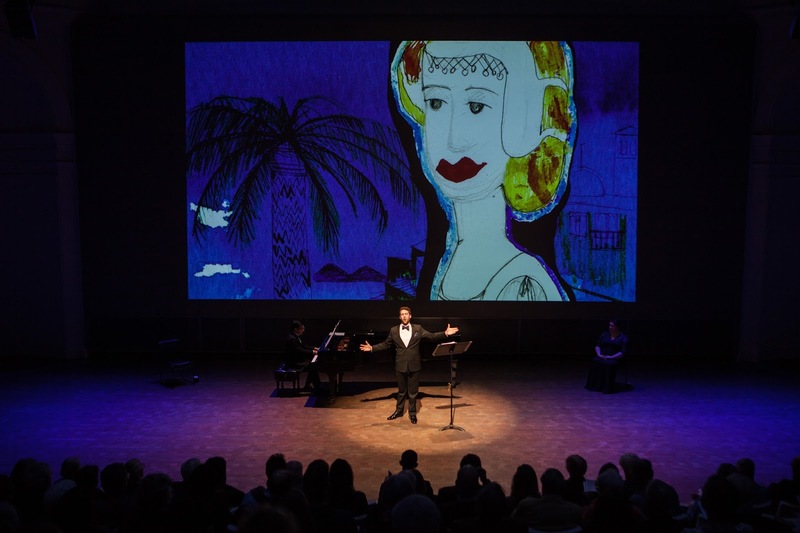 While all of the songs were originally sung by Stockhausen (and are still part of the baritone repertoire), Umezawa divided them between bass-baritone Christian Pursell and soprano Felicia Moore (both 2017 Merola alumni). Pursell thus assumed Peter’s character, complemented by Moore taking the role of Magelone (and, in a single song, the pagan Sulima, whom Peter encounters during his travels after he thinks he has lost Magelone). On my Brilliant Classics recording of Opus 33, the full combination of songs and narration fills a single CD lasting about 80 minutes. That was pretty much consistent with last night’s performance. Unfortunately, while each of the songs is a musical gem unto itself, Tieck’s prose is long-winded at its best and tedious at its worst. Neither Umezawa nor Rubio could compensate for the author’s shortcomings; and Rubio’s inability to pronounce “Provence” properly was more than a little annoying. Martin’s videos did little to improve the situation, since, for the most part, they simply illustrated Tieck’s words at the same sluggish pace. Fortunately, the music did its best to rise above the shortcomings of its context. Merola may have trained both Pursell and Moore for opera, but neither of them showed the slightest difficulty in applying their technical skills to an art song setting. Indeed, both of them clearly knew how to use body language to capture those narrative elements reflected in each of Tieck’s poems. Nevertheless, it was hard to escape the feeling that the evening was longer than it should have been. (It was beginning to feel that way even before Sulima put in her appearance.) Perhaps Brahms’ conception of a “song bouquet” was the right one after all!